If you’re looking for a good iPhone X battery case at a great price, your search just ended. 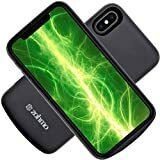 The Zohmo Slim iPhone X Battery Case packs a whopping 3,000 mAh of juice into a battery case that’s surprisingly slim. It more than doubles your iPhone’s battery life, and yet it only costs $35 on a normal day. Today isn’t a normal day, however, because Amazon is running a killer sale that slashes half off this awesome new case. It’s just $17 today, but there’s no way this deal will last very long so grab one while you can.